But what Gillum said is true. DeSantis did talk at a conference held by a man with white nationalist views. 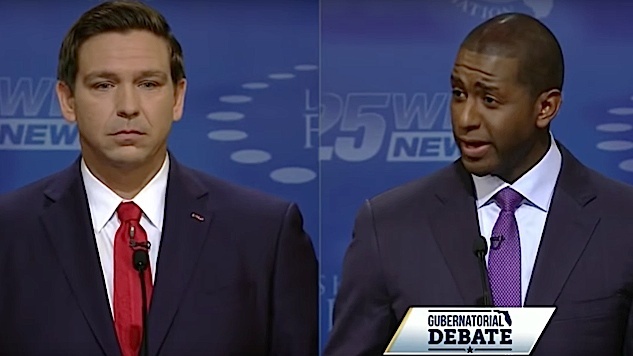 DeSantis did take money from someone who called President Barack Obama a racist slur (although he condemned the comments and said he will no longer take money from the contributor). He has been reportedly supported by a white supremacist group from Idaho through racist robocalls (which the DeSantis campaign, for its part, called “appalling and disgusting”). Any Democrat who watched this needs to take note—a bit of charisma, combined with refusing to constantly play defense or kowtow to an imagined middle, can work wonders. It’s no surprise that Gillum leads in polls by an average of about six points. Voters respond to this. They want passionate people, and they want someone who tells it like it is. You can watch the full clip, which includes DeSantis’ original response, below.